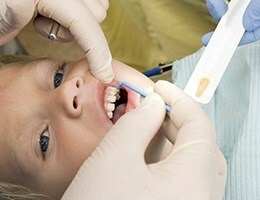 When you were a child, your parents probably took you for dental checkups at least twice a year. As an adult, you should continue this healthy habit with regular preventive care from James Olsen, DDS. As an Ann Arbor dentist, Dr. Olsen understands the role that a well-designed dental care plan plays in the health and wellness of not only your mouth, but your entire body. Moreover, he also knows that a beautiful smile requires routine maintenance to retain that bright, healthy look. With just two checkups and cleanings each year, we’ll be able to learn everything we need to make sure your smile stays healthy and beautiful for a lifetime. With a dental cleaning, our hygienist will use specialized tools to remove all the plaque and tartar on your teeth that can lead to stains and cavities, and then Dr. Olsen will perform a thorough exam. This will enable him to catch any problems you have early so he can take care of them quickly. At home, you need to brush your teeth at least twice a day and floss your teeth at least once. 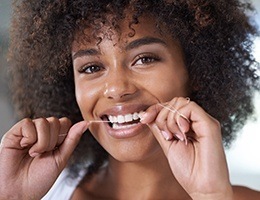 When you brush and floss, you remove plaque, which is the clear, sticky film that hides the bacteria that can cause both tooth decay and gum disease. We just love to make little Ann Arbor smiles shine, and we can help them enjoy a lifetime of strong, healthy teeth. Dr. Olsen is a father himself, so he understands the importance of high-quality pediatric dental care more than most! 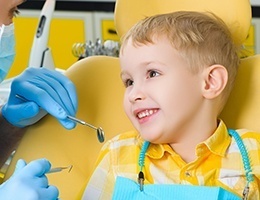 Using a combination of specialized treatments, patience, and a gentle touch, he’ll make sure your child enjoys calm, cool, and comfortable visits and always gets exactly what their smile needs. 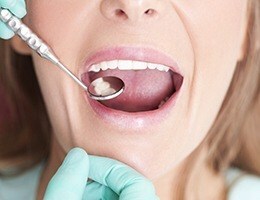 One of the most common troubles we find is gum disease. Believe it or not, estimates are that about 80% of American adults have a degree of gum disease right now. 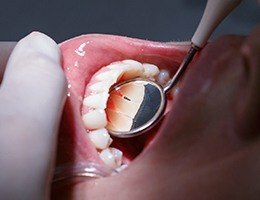 For patients with gingivitis—early-stage gum disease—we can treat it with scaling and root planing to completely remove plaque and tartar and smooth the root surfaces. If necessary, we’ll apply a topical antibiotic to treat the bacterial infection that causes gum disease. If you have periodontitis—advanced stage gum disease—then we can use a dental laser to reduce the infection, encourage gum tissue reattachment, and reduce bleeding and swelling. Bruxism is a very common condition where a person clenches their jaw and grinds their teeth at night, and over time, it can severely wear down the teeth and even cause them to break! 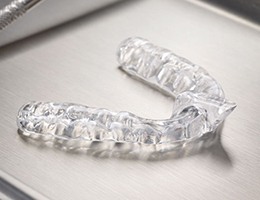 If you’re suffering from bruxism, we may recommend that you wear something called a nightguard to bed, which is a custom-made mouthpiece. It will place a firm but comfortable barrier between your teeth to keep them safe while you rest easy. Oral cancer is an often fatal disease that is actually very treatable when detected early, so in order to make sure you or a loved one isn’t caught off guard by this terrible disease, Dr. Olsen will perform an oral cancer screening as part of your regular checkups. He’ll examine your lips, gums, tongue, cheeks, throat, neck, and face, and should he find anything that causes concern, he can help you take quick and appropriate action. Fluoride has been helping keep smiles healthy and strong for decades. You’ll most often find it in toothpaste as well as public water sources, but to make sure your family’s smiles are extra protected, we can provide a topical fluoride treatment at your regular appointments. Your teeth will be exposed to a highly-concentrated fluoride solution for just a few minutes, and it will help keep you cavity-free year after year! If you or a loved one suffer a knocked out tooth or develop severe dental pain, you’re going to want to get dental care fast, and for that, you can always call Dr. James Olsen. We try to see all emergency patients the same day that they call in, so when you’re in pain, we won’t keep you waiting. We’re able to handle a wide variety of dental emergencies in-house, and we’ll work as hard as we can to quickly turn your emergency into a distant memory.